Though he fondly recalls growing up amongst rows of pickling cucumbers and snacking on orchard apples while completing homework, Fue Yang didn’t originally aspire to be a farmer. “The farther I tried to get away from it, the deeper I got involved,” says Fue. At Missouri’s Webb City Farmers Market, Farmers Market of the Ozarks, and Ozark Farmers Market, you can find him manning Yang Family Vegetables, a business he runs with his parents, Neng and Zoua. There, Fue stands behind his bunches of broccoli, cucumbers, tomatoes, zucchinis, summer squash, and an assortment of onions and other fresh produce. He also stands behind a way of life he has come to embrace. Agriculture is an aspect that defines the Yangs’ Hmong heritage, and the Yangs have been growing food ever since Fue can remember. During the Vietnam War, Fue’s father was recruited into the CIA organized Special Guerilla Unit, serving as part of the Hmong resistance movement in Laos. In 1980, the Yangs found refuge in Massachusetts. From a backyard vegetable garden to agriculture jobs, the Yangs stayed connected to the land, and in 2004 Neng and Zoua began Yang Family Vegetables. Fast forward to 2010 when Fue’s parents retired, and joined Fue and his family on their 43 acre cattle property in Southwest Missouri. Neng and Zoua wanted to pick veggie farming right back up, a decision that brought Fue to the forefront of farm operations. It was during this time that Fue began to seriously consider his personal investment into the agricultural realm. After much deliberation, he decided to further his knowledge, and in 2015 he enrolled at Crowder College to pursue a business ag major. Little did he know that forces were at work to deepen his involvement in the local agricultural scene and evolve his family’s farming techniques. A few weeks after receiving his Crowder acceptance letter, Fue got a call from Eileen Nichols, Webb City Farmers Market Master and soon-to-be internship supervisor. She called to relay an internship opportunity through the Webb City Farmers Market, made possible by a Missouri Department of Agriculture grant, and in partnership with the Lincoln University Extension and the University of Missouri Extension. The grant would fund an education center consisting of two high tunnels and a seed starting greenhouse. With season extension and winter production in mind, the project would host monthly walkthroughs and several workshops open to the public throughout the year. “One of several goals of the project is to train a Hmong farmer, young, committed to a career in farming, fluent in English and Hmong and well-respected in the Hmong community. 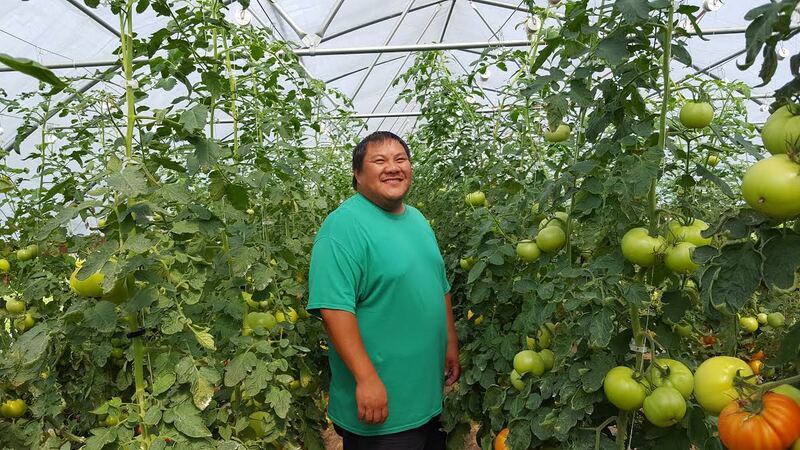 We hope that Hmong teaching Hmong will be an effective way to introduce high tunnel technology to that community, which makes up about 35% of our farmers,” explains Nichols. Fue describes the area’s Hmong community as being tight-knit, and remembers the initial project response as being very positive because of the hands-on learning approach it offered interested farmers. Taking into account Fue’s hectic schedule and the family’s inexperience with high tunnels, the Yangs were initially uneasy about the project. However, after learning more and seeing them in action, the Yangs made moves to buy a tunnel of their own. Eighteen months into the project, they did just that. “The Yang family has been completely responsible for the third tunnel, installing, planting and managing. You might say that it is the perfect demonstration that the project is working. A young farmer who knew nothing about high tunnels before the project began is successfully managing his own,” Eileen pointed out. Fue’s internship has impacted his own farming views and techniques while bettering fellow Hmong farmers’ high tunnel understandings. As a student, intern, and farmer, Fue has been exposed to many educational environments, and he finds farmers markets to be a breeding ground for learning. Fue gets it- he sees that agriculture is not a stagnant field, and that its practices are varied and evolving. Often times learning and teaching go hand in hand, and Fue brings that from field, to friend, to farmers markets. His outlook is refreshing, with an easy understanding that small farmers aren’t so small, after all.